The mighty sequoia is shown making its slow trip from the hospital campus to its new home in a Boise city park. 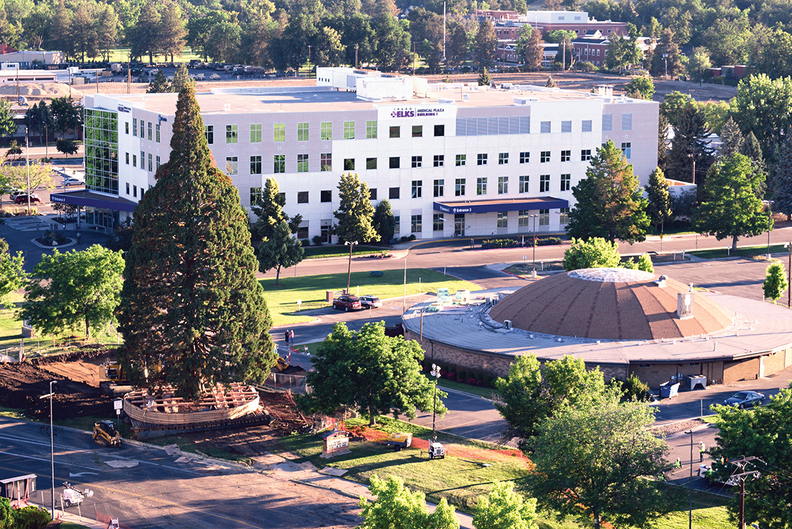 More than a century after it was planted as a sapling in a doctor's yard, a 10-story-tall sequoia has taken up residence down the street to make way for an expansion of St. Luke's Boise (Idaho) Medical Center. As a gift to the city, St. Luke's Health System spent about $300,000 to move the 98-foot, 800,000-pound tree the two blocks to Fort Boise Park late last month. "We understand the importance of this tree to this community," said Anita Kissée, a spokeswoman for St. Luke's. Cutting it down "was never even an option." More than 100 years ago naturalist John Muir sent four sequoia seedlings to Emile Grandjean, a conservation-minded professional forester and early employee of the U.S. Forest Service in Idaho. Of the four sequoias from Muir's seedlings, the only one that still exists is the one that was moved. It originally stood in the yard of Drs. Fred and Alice Pittenger, who planted it next to their home around 1912. The tree was moved by Environmental Design, which specializes in moving large trees. "This was one of the largest (we've) ever moved when measured by height and girth," said David Cox, western region vice president of the company. So far "the tree seems happy, but we are keeping a close eye out for anything unusual," Cox said. "I wish the heat wave would subside." In all, Cox's team spent about a month working on the project, with 12 men involved in the actual move, which took roughly 10 hours.